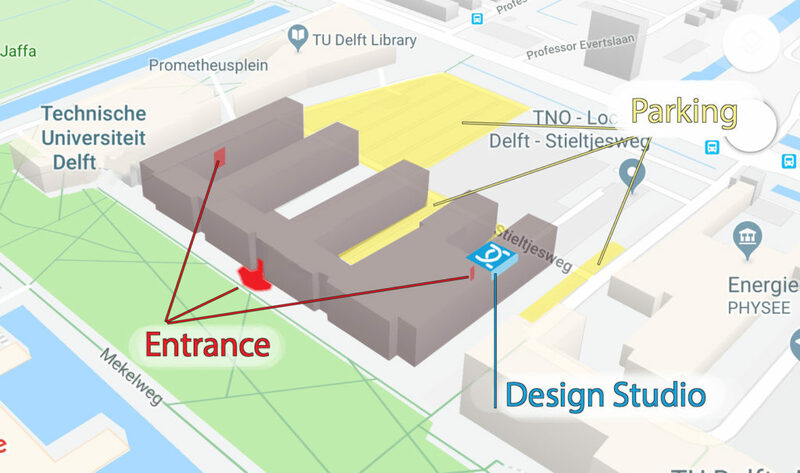 Our design studio, fabrication facilities & office are located at the Quantum Campus Delft, which is located at the Applied Physics building of Delft University of Technology (building 22). The building is on campus right besides the Aula/congress hall, with parking spaces on the backside. We are located on the third floor in the E-wing (furthest away from the Aula), as located in the image. The easiest is to program your navigation system to go to Van der Waalsweg 8, 2628CH, Delft. There is a lot of parking space available and you can enter the building at the E-wing (give us a call to open the door). Alternative you can enter the building at the side-entrance near the Aula, go to the first Floor and walk through the walking bridge to the end of the building to the E-wing (you will pass by QuTech, which is located at the B-wing). We are located on the third floor close the stairways. From the train station in Delft the campus is a 20 minute walk. Otherwise you can take from there the bus towards Rotterdam (40 and 178).